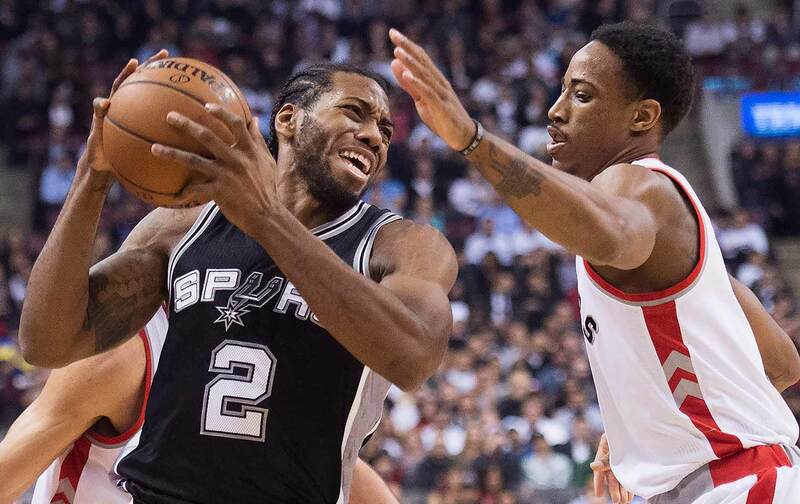 The trade of Kawhi Leonard for DeMar DeRozan reveals something about the gap between image and reality in the NBA. There is a pervasive stereotype that the NFL, with its 100 percent injury rate, non-guaranteed contracts, naked collusion against signing political athletes, and constant acrimony between players and management, is cutthroat to its very core. On the other hand, the media narrative around the NBA suggests it’s a “players league” that’s all happy, happy, joy, joy; a Shangri-La for the athlete who is looking to control their own destiny. That narrative was dunked in the trash this week with a trade that has “both primary players involved…furious with the move” The trade in question was Toronto Raptors All-Star forward DeMar DeRozan’s being sent from his beloved team to the San Antonio Spurs, in exchange for another All-Star player more highly regarded but coming off an injury, Kawhi Leonard. The Spurs felt like they needed to make this move. Leonard was entering the last year of his contract and had already made clear that he had no interest in re-signing with San Antonio. His dream landing spot, according to all reports was the Los Angeles Lakers, his hometown team, where he could play alongside LeBron James. Yet the Spurs had no interest in fulfilling that dream, let alone trading Leonard inside the Western Conference. The Spurs coach, future Hall of Famer Gregg Popovich does not want to helm a rebuilding team at this point in his career, so this trade for DeRozan who still has three years left on his contract, is a very good one for them as they aim to compete with the Golden State Warriors and Houston Rockets this coming season. No rebuilding for Pop. But, for DeRozan, this move was deeply embittering. He signed a long-term deal in a Canadian market that historically has had a very difficult time keeping star players under contract. But DeRozan was more than just a player happy to be in Canada. He was an ambassador for the city and the team. All of this speaks to the original point. The NBA is a ruthless multibillion-dollar operation that will always put the individual needs of players last, if the players themselves fail to seize their own destiny. When players manipulate free agency to create their own “super teams,” the naysayers should bite their tongues. As this DeRozan and Leonard trade shows, if you don’t put your destiny in your own hands—insisting on no-trade clauses or signing short-term deals that allow you to access free agency—then teams will take your destiny and sell it to the highest bidder.